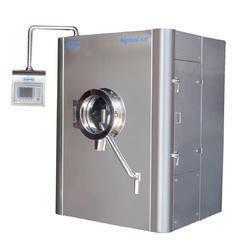 Leading Manufacturer of sigma autocoater, tablet coating machine, pilot scale auto coater, lab model auto coater, coating machine and entric auto coater from Ahmedabad. ü Tablet Coating System is an equipment that coats the external surface of tablet using a thin film of coating material. ü Machine is relatively simple where aplication of coating material is done on a moving bed of tablets and removing rapidly the solvents using current hot air. ü For the tablets to be coated, placed in closed perforted drum which is made to rotate continuously in an orbital manner the influence of a stemlined plates. ü During the orbital motion of tablets the coating media spray automatically in a rational manner in order to avoid excess coating on tablets. ü Angled baffles are also fitted into the drum and also air flow is provided which acts a means of mix the tablets. ü The baffles cause the tablets to be lifted and turned from sides of the drum and onto the centre exposing all the sides of the tablets to the sprayed coating. ü Whilst the spraying going on, hot air is introduced from the 53% perforated tablet bed which causes rapid drying of the coating medium. ü The hot air comes from inlet fan and is regulated in temrs of temperature and volume. 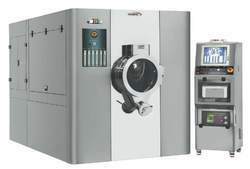 ü The regulation of air allows for maintenance of the drum pressure relative to that of outside room for the purpose of providing a completely isolated process atmosphere. 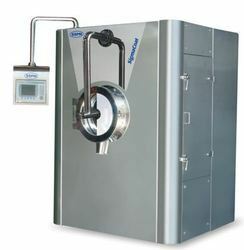 ü The regulation of the air also provides controlled drying and tablet extraction rates. It also allwos for an evenly spread medium on the tablets giving the tablets a smmoth solid surface. 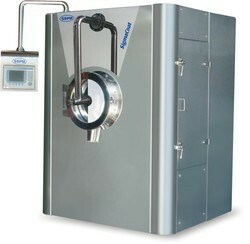 ü The regulation of the air also provides controlled drying and tablet extraction rates. It also allows for an evenly spread medium on the tablets giving the tablets a smooth solid surface. 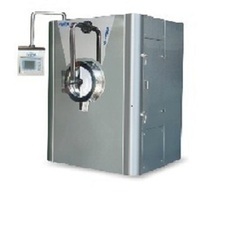 Leveraging on our sound infrastructure facility, we have been able to bring forth a qualitative range of Auto Coater Machine that meets the needs related to pharmaceutical tablet coating process. Incorporated with advance mechanism, the machines boost the productivity and flexibility in the business process. 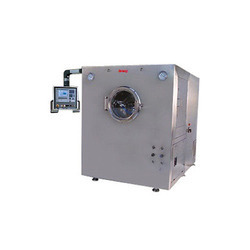 Solution tanks, multi air pump, double skin AHU, exhaust blower and wet scrubber assemble are some features that are included in the machine provided by us. Moreover, HEPA filter maintenance monitoring makes the operations much more efficient. With industry excellence, our firm has emerged as a noted manufacture, supplier and exporter of Automatic Coater that are based on highly advance mechanism. Finest quality raw material procured from trusted vendors is used by our team of experienced professionals in manufacturing the machines. Available with varied working parts like air pump, solution tank and more, the coater helps in undertaking the tablet coating process in the most efficient way. With solution tank, multi air pump, double skin AHU with Pre, Micro, HEPA filter. With steam and chilled coil. With spraying system USA make Anti-Bearding Spray Gun. Fastest Production in lowest time. Reduces manufacturing cost by at least 10% to 15 %for each batch of tablets by savings in its Utility in terms of Air Consumption, Electricity and Steam etc. Reduce coating time, increase productivity of Tablets than any other system. Increased solids concentration in solutions and enormous saving of coating solution at least 15-20% Enormous saving in coating solution. Homogeneous, adjustable spray pattern with better rollover of tablet. cGMP Model and no operator involvement necessary during the process. Washing / Change over process is less. Precise weight gain in definite time frame. Interchangeable design can be possible on request. ü Interchangeable design can be possible on request. Looking for AUTOMATIC TABLET COATING MACHINE ?